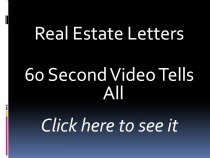 Marketing for Real Estate; Discover the leveraging power of real estate letters. Marketing for Real Estate Leads via letter writing campaigns can't be beat, but writing compelling sales copy is a tall order. However, if you get it right it can lead to more leads; listings and sales. You're raring to go. You're newly licensed and eager to get your first prospect. Plus, you have more time on your hands than you know what to do with. Actually, you're a little bored. This is definitely not how you had envisioned the start of your career. Still, you know that you can be as good as other agents; you just need a break. A solid real estate sales letter could be just what you need. But the problem is they're not easy to write, which begs the question; "how do you write a good letter that will lead prospects to do business with you?" There are many ways to write effective sales copy, but in many instances it comes down to this; learn to be attentive to the needs of your clients, and explain in simple language why they should do business with you. With that said, let us move on to what components you should include in your sales letter to make it outstanding. First, identify the problem of your targeted market. Are they buyers, sellers, investors, or renters? Convey that you understand what their problems are and that you stand ready to assist them. Second, offer simple and practical solutions. Forget about being fancy and trying to one up the next agent. Instead, simply let the reader know they have found a unique solution to their specific need. Third, show the benefits of doing business with you. Is it that you have a strong network of agents with buyers and sellers? Or are you a workaholic and will work tirelessly to earn and keep their business. Accentuate whatever it is and don't worry too much about being modest. Now is the time to toot your own horn. Fourth, close with a call for action. Make it something that leverages them into action. When Marketing for Real Estate Leads with letters every letter won't be a home run. However, if you follow this formula you may have more than you do now. These pre written real estate letters in my portfolio can help you get off to a good start.